The arresting and intriguing architecture, cuisine, history and natual beauty of Morocco will entice you into further exploration. If you are planning a Moroccan vacation, you are in for an adventure! There are still some places on Earth where time seems to stand still, and you will get this feeling in some parts of Morocco. 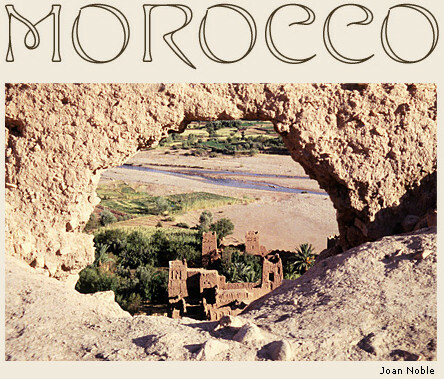 If you have not already read Joan's article entitled, "What To Expect In Morocco", you should probably start there. Also, don't pass up "How To Shop in Morocco" for more interesting information. Don't worry about having local currency, called "dirhams", pronounced, deer'ham, before you arrive in Morocco. There are banks at the airport or you can change money at your hotel. Banks are open Monday through Saturday morning to exchange foreign currency and travelers checks, but strongly suggest avoiding them. The lines can be very long. You can use ATM machines, which are widely available in towns and cities, and in some hotel lobbies; they dispense the local money, dirhams. There may be a daily limit as to what you can withdraw—perhaps $300 to 400. Your hotel can also change money but sometimes run out, so check with the desk. It is a good idea to carry around $50 worth of local currency, bills and coins for miscellaneous purchases, coffees or sodas for a few days. Many shops and restaurants accept credit cards"Visa and Master Card. American Express is more difficult to use, due to high fees charged to the vendor. Also, be aware that your Visa or Master Card may charge foreign exchange fees on your monthly statement, as American Express does, unless you are a Platinum Card member. Before leaving home, call the customer service number on your card to let them know where/when you are traveling, ask if you need a special pin number and if they charge the exchange fee. Some shops will accept dollars. Do not bring or wear any expensive jewelry, or large amounts of cash in a wallet you might bring out in a shop to purchase something. Keep the cash in a money belt; if you need to access it, ask to use the bathroom or find a secluded corner to get out the cash. When shopping, keep a small amount of money in a pocket. DO NOT pull out a roll of bills. Especially if you are bargaining for something, as it will show the vendor you do have more funds available. The same security measures you use in any big city in the U.S., or the rest of the world, should also be practiced here. Acceptable medical care is available in towns and cities, but it is strongly suggested you check a physical and dental check up before leaving home. Should an emergency arise, your guide and/or hotel will take you to a good doctor, English-speaking when possible. Please purchase travel insurance for medical and emergency evacuation purposes, as these can be quite expensive. Medicare and some other American policies may not cover expenses abroad—please check with your insurance company. Always keep your meds in your carry-on while traveling; you don't want to risk the airlines losing that bag. A second pair of glasses is also a good idea. You can purchase many over-the-counter remedies at the local pharmacies. Tipping has become more common since Americans seem to need to do so. Taxis are quite inexpensive and you can just round up the amount to the next even number. A couple of dirhams per bag can be given to hotel porters. If you have a guide, you can tip from about $5 per day, depending on his expertise; if you are staying in an upscale hotel and they arrange a guide for you, ask for their recommendation. Do leave a couple dirhams at a bar for a coffee or tea; in a restaurant, check the bottom of the bill to see if service has been included. If so, no need to leave anymore. If not, up to 10% is generous. Noble Journeys has been arranging journeys through Morocco for individuals, families and small groups interested in art, architecture, weaving, religion, women's issues and so much more, since 1995 and would be happy to discuss your interests in traveling there. Contact us or visit our Morocco main page for more information about an exciting Moroccan vacation.